The Secret Betting Club sent us this email about better betting this new year. 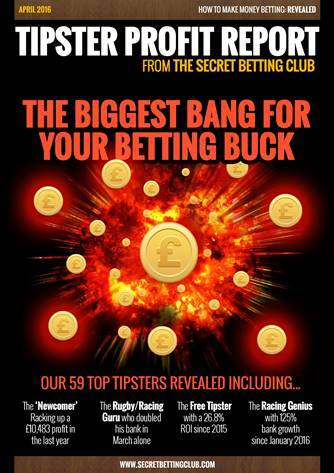 We like the Secret Betting Club and they are useful to people wanting to improve their betting habits. They are independent and so can give honest reviews of tipsters and really help weeding out the rubbish. This is what they say for 2016. The easiest step to make money betting in 2016 is to hook up with one of the genuine, free tipsters that we track here at SBC.Take for example the profitable record below from 3 different free racing tipsters who each have been operating for several years. Their results are outstandingly profitable, whichever way you look at it and they offer a great solution to get started in 2016. 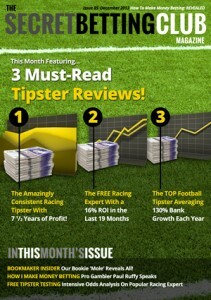 You can read detailed analysis on all 3 (and several other free tipsters) as a Secret Betting Club member. Once again, it’s another immensely profitable service, both over the past 12 months and longer-term. Perhaps best of all are the Return on Capital growth figures, which stand at a whopping 267% over the past 12 months and 915% long-term. This guy’s tips are making serious profits.The cost to you for following his advice? As little as £33 per month and just over a £1 a day for his quality tips. As a Secret Betting Club member, you can also follow a series of free tipsters that post exclusively on our forum. You can simply login to the site and follow their tips every day. 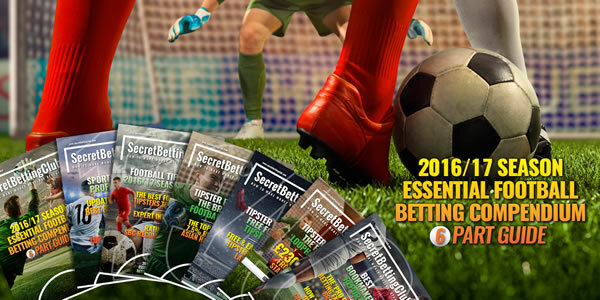 Here at the Secret Betting Club, we have over 10 years experience of helping people make money betting and have plenty to help you make 2016 your best punting year yet. Paul Pogba has used the World Cup in Brazil as opportunity to shine on the global stage and establish himself as one of the most talented young players in the sport. The Juventus midfielder will be hoping to help his side win the competition for only the second time in their history, in which they are now just single figures to do so with Betfair. In two years’ time France will host Euro 2016, and along with Pogba, should be at their peak. The 21-year old may possibly be the best midfielder in the world, if he continues to improve. Les Bleus could be a good bet to win that tournament in their own back yard, especially if they go all the way in Brazil as their odds will shorten with Betfair. There have been comparisons with Pogba and his French compatriot Patrick Vieira due their height, however, the Juventus man is much better player with the ball at his feet. After the World Cup, the Frenchman will have to make a big decision about his future as there are a number of clubs queuing up to put an offer on the table for his services. One of those interesting parties is thought to be Chelsea who won’t be put off by his £50 million price tag. A move to the Blues would see him to return to England as he spent four years at Manchester United as a youngster. Limited first-team opportunities under Sir Alex Fergusons forced him out of Old Trafford, a decision the former United boss must regret, even to this day. Chelsea boss Jose Mourinho is in the process of rebuilding a team at Stamford Bridge after their trophyless season last year. He has already added Cesc Fabregas to his squad but he won’t be afraid to spend more cash if he believed Pogba was interested in the move as it would be a smart investment for his club. Juventus will be playing Champions League football next campaign where they can be backed with Betfair so a move is not necessary for Pogba to play at the highest level. A lot will depend on whether he fancies another shot at the Premier League or if he is currently happy in Italy. Mourinho has a good record of improving younger players so he may see the opportunity as a way of developing under the Portuguese coach.